I like the idea of “Meet …” as it’s an invitation to get to know, perhaps personally understand, many of the iconic men and women who have shaped Australia. Meet … Ned Kelly is the first in this picture book series that spans the education and trade markets. Told in verse, the story comes alive. The reader is involved in the action, just like in the bush ballads of Ned Kelly’s era. The font has a nostalgic look, as if it’s hot off an old-fashioned printing press. The armour protected Ned’s arms, head and waist. The bullets bounced off one by one. Sergeant Steele took a shot at Ned’s legs that were bare. With a cry, Ned collapsed and was done. We all know how Ned’s life ended, but we are given a poignant insight into his early life of poverty and fatherlessness and how his mother was gaoled with her young baby. We share the major turning points in Ned’s life both by verse and by following the handy timeline at the back of the book. As a young boy we learn how Ned saved a drowning child. He is presented with a sash for his bravery. Another poignant moment is the revelation that under his suit of armour, in the shoot out at Glenrowan, Ned is wearing the same sash from childhood provoking discussion on how deeply we are affected as children, along with the need to know that we have worth. Matt Adams’ illustrations are evocative of Sidney Nolan’s famous Ned Kelly series, with hints of other landscape painters of the era, like Arthur Streeton and Russell Drysdale. Sometimes, it’s like I’m standing in an art gallery. 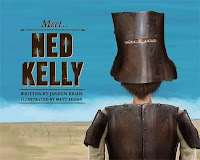 Young readers will connect to the pathos and humour within the illustrations as they engage with Australian history. The cover is startling as you face Ned close up. He is kitted in his ironclad helmet and armour, although I would love to have seen a peek of the green sash that he was wearing underneath. Award-winning author Janeen Brian has captured the essence of our most legendary bushranger and award-winning illustrator Matt Adams has brought him to life with colour and texture. An excellent read for 8+.